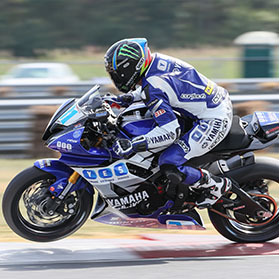 Graves Motorsports Yamaha R1 WORKS Adjustable Rearsets for the 09-14 model bike. Featuring billet aluminum construction, M1 footpegs, double roller bearings in the brake + shifter pivots and carbon fiber heel guards. Kit includes shift rod set-up for a Dynojet quickshifter sensor. Note: Works adjustable rearsets require removal of the stock kickstand assembly to install. Kit includes all pre-drilled ARP hardware. These works rearsets are for track use only (they are indentical to standard Graves R1 rearsets with the exception of the kickstand removing plate mount) and are the same rearsets that are used on the Team Zyvax Endurance R1. The carbon fiber heel guards are designed to be functional as well as look great. The sturdy, light weight construction ensure they will last when digging your heels into them.